Watch all the biggest matches and sporting events with NOW TV across your device. Passes starting from just €7. Choose a Sky Sports Pass and only pay for the days you want with a Day or Week Pass, or get a whole month of live sport with the Month Pass. Plus if you're watching on the go, get 5 Sky Sports channels on your smartphone with a Sky Sports Mobile Month Pass. That's the biggest live matches and events from just €7. 5 channels straight to your smartphone for a month. *Pass auto-renews after pre-paid period at €7 a month, unless cancelled. No contract. The best Sky Sports action for 24 hours. All 11 channels for a whole month on loads of devices. *Pass auto-renews after pre-paid period at €39 a month, unless cancelled. No contract. The best action from the next 7 days across all 11 Sky Sports channels. No matter what your favourite sport is, Sky Sports has got you covered. Find out more about the top sports you can watch when you get a pass. With the Sky Sports Mobile Month Pass you can get unlimited access to 5 channels, including Sky Sports Premier League. Get yours and start watching instantly from £7.99. *Watch these 5 channels on the Sky Sports Mobile Month Pass. All 11 channels available on a Sky Sports Day, Week and Month Pass. 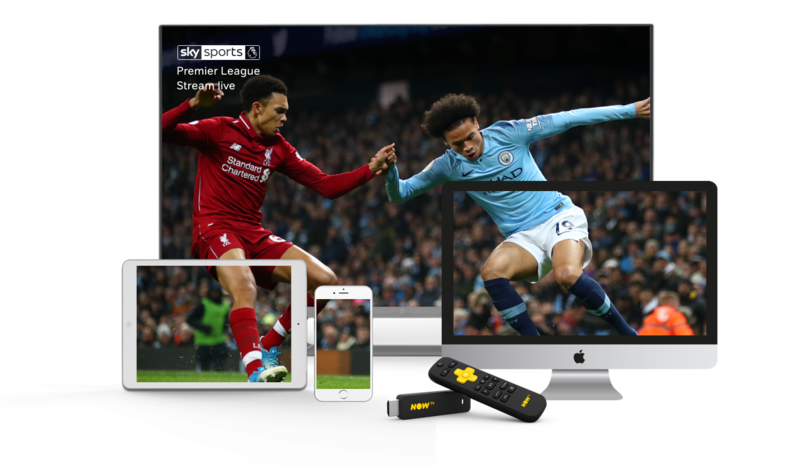 Watch instantly on loads of devices, including iPad, iPhone, your PC and even stream through games consoles or our very own NOW TV Smart Stick.